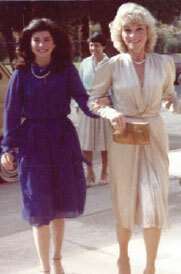 Elizabeth and Judy in 1981. A decade: 10 years. 120 months. 3,652 days. 87,658 hours. 5,256,000 minutes. 315,360,000 seconds. Alzheimer’s: At least 44 million people living with the disease worldwide. More than 5 million in the United States. Over 15 million U.S. caregivers. $214 billion spent annually for care. The Judy Fund: 1,600 donors. 511 Ambassadors. $5.1 million raised and granted. continue to push this disease upward to scale the mountain called survivorship, there are summits that allow us to look back while readying for the future. Marshall began this Fund in July 2003 as Judy said goodbye to us all. His vision was clear: He would raise $1 million from colleagues and friends in her name. And he did — within four months, he engaged a core group of very generous donors, all of whom are still with us today. But we knew we couldn’t stop there. We invested in research — from beta-amyloid trials to patient care — and realized we still had a lot to do. The Judy Fund joined the Zenith Society, the highest level of giving at the Alzheimer’s Association®. Worldwide, this group of private donors continues to set a high bar in generously donating their time and money. In 2004, along with our dedicated partners Eddie Keller and Pat Kaplan, we produced Memories A Judy Fund Gala for four years, raising over $500,000 annually to support the Alzheimer's cause in the Coachella Valley. In 2010, our Fund took a strategic turn, driven by Marshall’s clear understanding that federal funding would be one of the most potent ways to find a cure. We invested in the Association's Ambassador Program, helping support the creation of a network of 511 advocates (and growing!) who maintain a conversation with their legislators year-round. The Judy Fund donors have fueled this program, which, among other landmark accomplishments, helped usher in the National Alzheimer’s Project Act (NAPA), one of the key tools to frame federal funding of Alzheimer’s in the United States. The men of the Sigma Alpha Mu national fraternity (Sammies) have become soldiers in our ongoing fight. This fall they'll grow their beards long to help keep brains strong. During the past decade, we learned that women are not only disproportionately affected by Alzheimer’s disease, they are also the engine of the fight against it. The Judy Fund Salon Series, Mind & Heart, targets women of the baby boom generation, raising awareness of how heart and brain health may be connected. Still Alice, a film based on The New York Times best-selling novel is coming to theaters this holiday season. I’m also very excited about the new Alzheimer’s Association women’s initiative, My Brain™, which is inspired by Maria Shriver. Read about it on page 4 and join 1 million women on the front lines of the fight. How do you measure 10 years of The Judy Fund? Sit down, get comfortable and read about all we have done together. Have a glass of red wine — after all, it’s good for your health — and let’s see where the next decade takes us. My toast is to you!